Planning a doggo date in Koramangala? Or just a good long walk with a side of playing fetch? You are in luck, because we found plenty of spots where you can hang out with your dog. 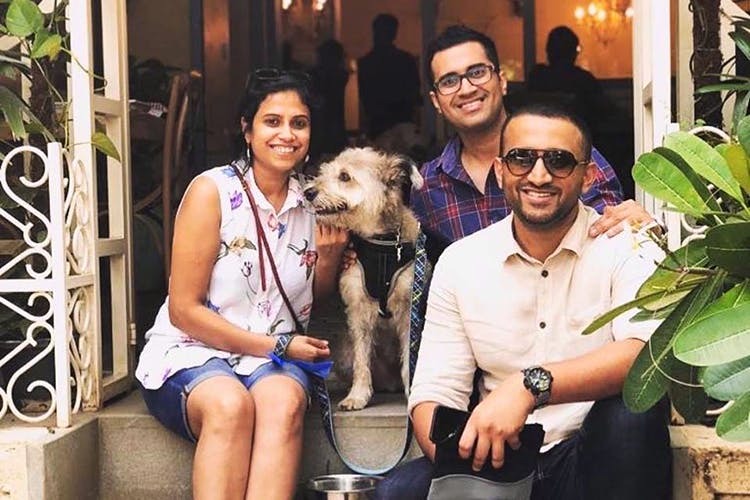 Some of these are cafes while others are good old parks, but in any case, these pet-friendly places in Koramangala will ensure that you and your pupper have a jolly good time! A massive park complete with a jogging track and a dried up lake, it’s solid playtime at the BBMP 5th Block Koramangala Park. It is perfect to take your dog and playing fetch, or just to let them run about from being in your home most of the time. Even though there’s no dedicated dog spot, you can pretty much make friends with the other dog parents who frequent the space. We know because we’ve tried! The entire stretch of road opposite DYU Art Cafe is flanked by huge trees and without any vehicle traffic during most of the day. It’s perfect for that leisurely stroll around with your four-legged friend. There are plenty of stray dogs on near the part at the end of the road, so if your little pooch is not of the friendly kind, it’s best to turn back and walk back the same way. There are a few benches on the pavement for you to sit and catch up on some reading while your doggo naps, though it will be tough to not let them play around! The writer’s go-to spot for all his doggy dates, the pizzeria has a pet-friendly policy as well as staff who absolutely loves all sorts of pets. We hear they have had pet parents who have come with their kittens and parrots too. They don’t have a pet-friendly menu, but they do keep treats and a doggie bowl. Places like Bundar, What’s In A Name, and The Toddy House are also pet-friendly. Though those too do not have a pet-friendly menu. We get that you want to be your dog’s only friend, but don’t be greedy. Your BFF needs more friends too. And that is where Ruff Pet Services come into play with their play area and a splash pool. The play area is covered with trees and free of any obstacles allowing your doggo to run wild with his new friends. Post play time, he can jump into the splash pool and cool off with a swim. Be sure to carry towels with you or you can head to the grooming area where your furry pal can get a proper makeover. They also organise birthday parties complete with birthday cakes and hats for doggies. What, you thought only humans can have all the fun? For your next lazy Sunday Brunch, instead of having to leave your puppy poo behind, you can take them to The Reservoire where the good folks are more than happy to serve you and your four-legged pal. The Reservoire’s ground floor and terrace are pet-friendly all through the week. Besides, pet parents, you will be happy to hear that they also have a pet-friendly menu on request. See tt’s not just you who will have a good time, but your pet too! Okay, we admit it’s not Koramangala, but hey it’s only about 10 minutes drive from there. One of Bangalore’s biggest lakes, it’s a spot for morning jogs, lazing around, and most importantly catching that sunset with your furry BFF. Sure, it may not like catching a sunset on the beach, but hey, a good photo-op and possibly the next DP with you and your pet is a sure thing!